Many years ago maybe 15 years or so, my kids and I went to Planet Hollywood and ordered their Captain Crunch chicken, it was fabulous. We were really amazed how delicious it was as it didn't sound that interesting to me. Well the boys loved it, so I tried many times to make it and deep frying (as all the recipes out there stated) made the coating a sugary cereal sticky and candy like mess. 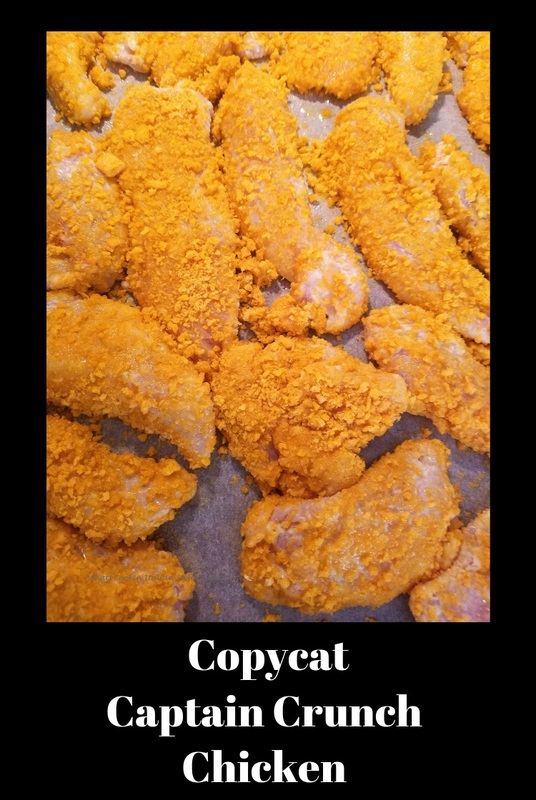 I just love this captain crunch coated chicken! We had this the first time in Sylvester Stallone Planet Hollywood's restaurant, being huge fan it was a big hit for the family. Well I finally made a method work for us and yes it's baked but everyone loved it. Though not the original way the recipe stated and to fry it, baked came out delicious and not all stuck together. This method worked great, it won't stick to your teeth or the pan. It's tender, delicious and moist chicken with a little sugary bite to it. I do recommend cooking on parchment paper and not foil so it won't stick. This is a keeper for us and hope for you too. Captain Crunch Works the Best! The original recipes calls for 2 cups of crushed corn flakes instead of flour. That coating is also very delicious but didn't seal in the juices like the flour did. 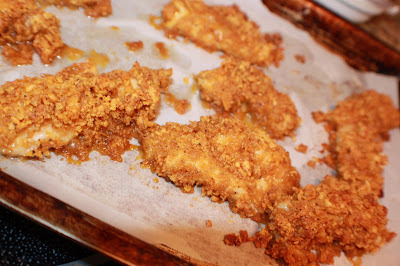 If I make corn flake chicken I do it the same exact way. Dip in egg whites, shake in seasoned flour, then in egg whites and into the corn flakes. Corn flakes however, will fry up nicely. The condiment of choice in Planet Hollywood, was to serve these with honey mustard. It really accents the sweetness and the perfect side. We are all huge fan of all the Slyvester Stallone movies, and we loved Planet Hollywood. Several years later we are still watching and loyal to this Italian actor who made himself the man he is today. His dream, his acting ability and writing, inspired us. Our family is grateful to his contributions and talent he has contributed. Although no the original recipe, this is as close as it gets and we love it. Captain Crunch Chicken is made often here in our home with Sly in mind and thank him for introducing us to this delicious chicken recipe! Copycat Captain Crunch Chicken is sweet and spicy with the honey mustard. The mustard dipping sauce really compliments the chicken so don't miss that part of the recipe. Give it a try, the kids love it! 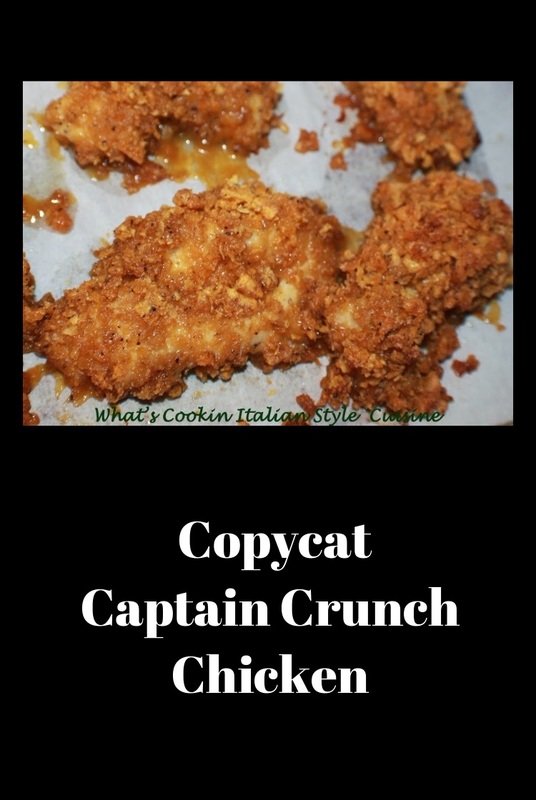 Copycat Captain Crunch Chicken is fun to make and fun to eat! The kids will love it, ask for it often. It's a great way to get them to eat meat for sure and the young at heart will love it too! Try some of my Dipping Sauces. 4 cups Captain Crunch cereal placed into a large ziplock bag and crushed with a rolling pin with chunks still remaining. In a large bowl place the chicken strips into the bowl and cover with egg whites. Place in the refrigerator for around 15 minutes. In a zip lock bag add the flour with garlic powder, black pepper. Take one piece of chicken at a time out of the egg whites Shake in flour. Dip again in egg whites then roll each piece of chicken into the cereal mixture until coated on both side. Place on a parchment lined cookie sheet. Drizzle each piece over the top with oil lightly or use cooking spray. Bake in a preheated oven of 400 degrees until browned around 30 minutes do not turn. I haven't had the Captain Crunch chicken before, but it sounds like a fun way to change it up. I much prefer baking it to frying it.